Carefully choose the plants that will go near a swimming pool or hot tub. Something that is attractive at 2 feet tall can grow quickly and drop leaves and debris into your pool in just a couple of years. Research the best plants, shrubs, trees and ornamentals that will survive and even thrive when planted next to a pool, and also blend in well with the rest of your landscaping. Succulents are increasing in popularity and are integrated with other plants in both front and back yards. That means they can be found growing poolside, where they can be foundation plants that are evergreen (or whatever color they are), sculptural in form, and hardy. 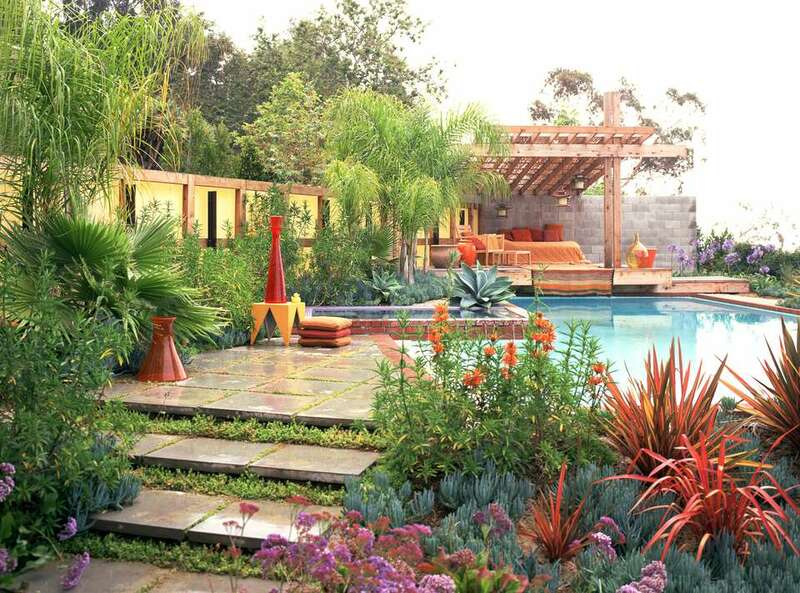 Just make sure succulents planted near pools and spas don't have spines (thorns or needles). Why? Children and pool-goers running around in swimsuits, with skin exposed. Many succulents don't have spines, or if they do, they can be small. Larger succulents with spines can be planted at the back of a border or raised bed. Ornamental grasses can be low maintenance and visually striking near pools. These types of grasses are not the lawn grasses with which you may be familia—ornamental grasses include sedges, rushes, and bamboo. Vines climb over walls and weave their way through fences and trellises. Most are fast growers and can quickly help to form a sort of privacy screen around pool areas, or can be trained as living roofs on arbors and pergolas. Carefully choose trees that will grow near a swimming pool, keeping in mind ultimate growth height and width. While considering potential trees, look for ones that won't make a mess as they drop their leaves, flowers, or fruit. If you live in a dry climate or region experiencing drought, then landscape with watering needs in mind. Many plants are drought tolerant, especially after roots have been established in the grounds for a year or so with regular watering. Container gardens can be beautifully arranged with plants that have similar care needs. They can also be moved around, depending on the time of year, occasion, etc. Choose hardy plants that follow the thriller, filler and spiller design technique, or plant just one type in tall containers. Nothing smells better than the lovely fragrance that comes from nature itself, specifically sweet-scented vines, shrubs, and trees. Plant a few near the pool, patio, along a path, or where you dine outdoors. Some plants become more fragrant during the evening hours. Many flowering shrubs, vines, and even cactus have scents that you can't capture in a perfume or candle. That's why nothing can beat the real thing in a garden. A pool surrounded by tropical landscaping is many homeowners' ideal for a private backyard retreat. If the climate permits, a pool area can appear more tropical with the addition of tropical plants like palms, bird of paradise, ginger, or other exotics. While their spines are not something you and your guests want to come in contact with, cactus can be striking and natural near a pool in desert regions. Plant them in raised beds or containers far enough away from the pool and center of activity.